Three of the longest-serving components of the Dow Jones Industrial Average (INDEXDJX:.DJI), past and present, experienced major milestones in their corporate lives on April 24. Two of these were notably positive, but one marked the end of a mistake that eventually cost the company its spot on the index. Let’s take a closer look at the major business events that took place on April 24 throughout history. The legendary Woolworth Building was completed on April 24, 1913. Commissioned by five-and-dime king Frank Woolworth and paid for entirely in cash, the $13.5 million, 792-foot skyscraper became by far the tallest building in New York City — indeed, in the entire world — when its doors opened that April day. It held claim to the title of world’s tallest building until 1930, when its 57 stories were surpassed by 40 Wall Street, the Bank of Manhattan Trust’s new headquarters. By 1930 Woolworth had already been a member of the Dow for six years, and it would remain on the index until 1997, when it sold the Woolworth’s chain of stores and renamed itself Venator Group to refocus on its footwear division. A year later, Venator sold the Woolworth Building to an investment group for more than 10 times Frank Woolworth’s original purchase price. 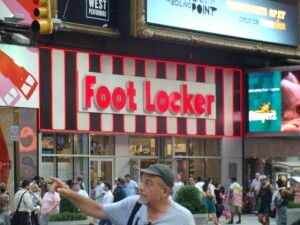 The only part of the Woolworth’s corporate empire now remaining is Foot Locker, Inc. (NYSE:FL) , one of the largest sporting-goods chains in the world. Known as the “Cathedral of Commerce,” the Woolworth Building actually went up during a period of extended economic weakness — as has often been the case with other massive skyscrapers in more recent times. In fact, it was not until 1921 that the index would really leave its 1913 doldrums behind for an extended period of time, and the very last time that the Dow closed at or below its April 24, 1913 value of 80.76 would be in 1933. Do markets go down as bigger buildings go up? The answer is more complex than that — but it makes for an interesting bit of financial trivia nonetheless. On April 24, 2001, a two-decade-long mistake was finally corrected when USX announced its plans to split two jointly held but separately traded businesses into their own fully independent companies: United States Steel Corporation (NYSE:X) and Marathon Oil Corporation (NYSE:MRO). The steel and oil companies had operated together under the USX umbrella since 1986 after merging in 1982, although each had been traded independently since 1991. The market’s confidence in each business had been plain to see since that time: U.S. Steel had lost 13% from 1991 to the time of the announced split, while Marathon had gained 65%. Of course, neither made a particularly good argument for its worth against simple measures such as the Dow. USX left the Dow in 1991 after its share split (ending a run that began in 1901), and the index did just fine without it, gaining 260% over the next 10 years. Marathon may have done better without any merger at all: By 2001 it was generating 90% of USX’s operating revenue, and at the time of the announcement its most recent quarterly net income was $478 million, compared to a $98 million loss in the steel segment. The decade following the merger almost brought U.S. Steel back into the lead against its oily counterpart. The company’s shares skyrocketed during the subprime bubble as construction-related demand surged, approaching 1,000% gains from the day of the split announcement. In the end, it became one of many stocks brought low by the financial crisis, finishing the post-split decade with a still-respectable 200% gain, compared to Marathon’s 350%. Either way you slice it, the split companies beat the Dow that decade: The index managed a meager 20% growth from the 2001 announcement to its 10-year anniversary.